Dallying In The Dirt, Issue #333 - A short warm spell provides a window to do some winter chores. That’s about as ready for winter as it’s ever going to get. We’ve had some freezeups some snow and today it was above freezing and relatively pleasant allowing me to get outside for some more cleanup. 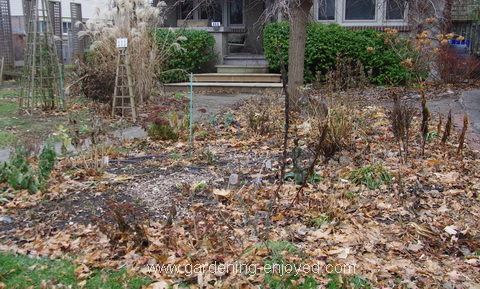 Nothing much gets done to these perennial beds. The Roses are pruned back by about half so they will not whip around in the winter winds and loosen any soil that I might hill them up with. There are lots of leaves in the beds and that’s a good spot for them. In a perfect world I would have had the opportunity to rake them onto the driveway and then run the mower over them to mulch them and then put them back onto the beds. That could still happen but it’s unlikely. Most of the perennials are not cut back in the autumn as they provide some winter interest a few of them feed the birds and lots of them will compost in place as well as providing shelter for overwinter bees etc. I have quickly adapted to this new idea that being tidy is bad horticulture. 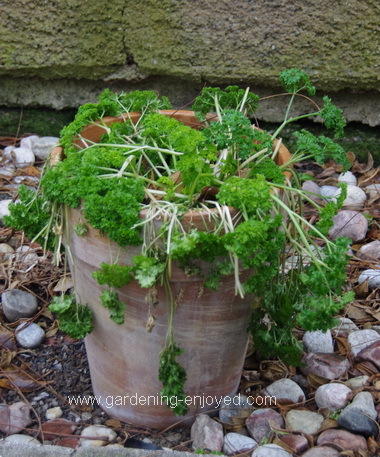 This is a pot of Parsley that somehow almost looks alive even after the snow and the hard freeze. I have carried it inside to see if it perks up and provides us with fresh Parsley for a few weeks. There wasn’t much room left in the storage shed anyway. The joy of gardening is the opportunity to try something new and different all the time. This Parsley can join the Orchids in the solarium. They are now starting to push out several bloom stalks. There hasn’t been some prankster in the back yard. The Earthboxes like to lay down and have a sleep for the winter. The automatic watering sensors have been removed but the tubing is staying in place this winter. The tipping makes sure that the reservoirs are drained of water so there is no chance of it freezing and splitting the containers. There they will sleep until it’s time to rejuvenate them in the spring. In the left corner you may notice that one is not tipped and a plant is still growing in it. Some of my longer term winter vegetables did not get a chance to develop before that early hard freeze and snow. I have pulled them all out except for that lonely specimen. It has a small head of Broccoli sitting there and I’m imagining a week of warmer weather that may let it develop further. All gardeners are really dreamers at heart. Yesterday in that bit of warmth I was able to attach a hose to the rain barrels and let them drain while I climbed the ladder and cleaned out the eaves troughs. They can now be stored, upside down, in a corner of the garden. I would like to have had the time to drain them into watering cans and then apply that water to the evergreens that like to have a source of water in the late winter when the sun starts to wake them up. Not enough time. I would also have put some on the newly planted bulbs to ensure they were well rooted. 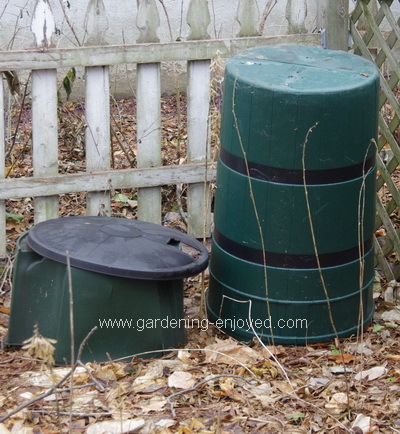 We have had sufficient rain this fall to take care of both of those needs and getting the barrels empty, so that they don’t freeze and split, was the higher priority. Gardening is like all life, a series of choices. 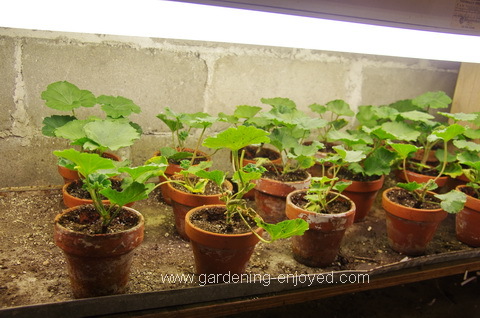 Inside where it was much warmer and more pleasant I did find the time to dig my Geranium cuttings that were very well rooted in the propagation bed and pot them up. Some of my Geraniums had some rot problems last year so I followed my own advice this year and scrubbed the pots to get them clean. There was a little bleach in the wash water to try and kill any surviving fungus spores that might think about attacking my Geraniums. Kathryn Asks? We're wondering what you plant under your black walnut. Our neighbour's black walnut has played havoc with our vegetable garden. We have given up on growing asparagus, rhubarb, tomatoes and black and red currants. Ken Answers! Vegetables are my biggest problem under the walnut and for that reason and several others I now grow a lot of vegetables in Earthboxes. Check my website to see my Earthbox use. My Asparagus bed is thriving and it is just outside the dripline of the Walnut. Under it I have an extensive and thriving Hosta bed along with lots of bulbs, a few Lilies and several other perennials. Success in gardening seems to be measured in overcoming each new challenge.